Verkfræðideild Háskólans í Reykjavík leitar að kraftmiklum einstaklingi í fjölbreytt og krefjandi starf verkefnastjóra á skrifstofu deildarinnar. Í boði er spennandi starf í metnaðarfullu og lifandi háskólaumhverfi. 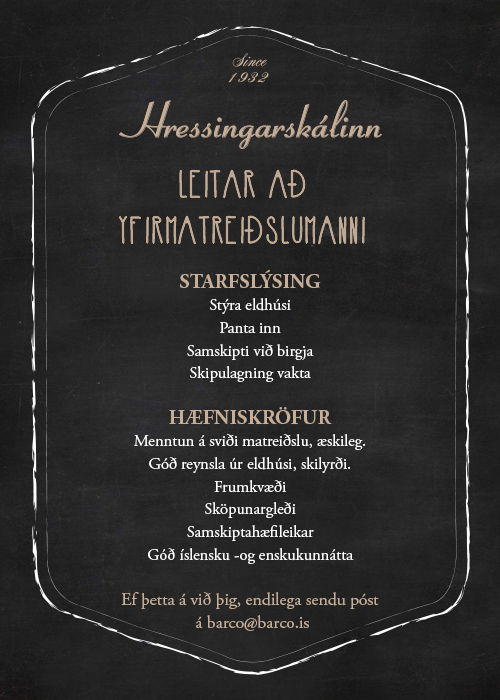 Starfið veitir ýmis tækifæri til að sýna frumkvæði með það að markmiði að skapa framúrskarandi náms- og vinnuumhverfi fyrir nemendur. The Financial Mechanism Office (FMO) is the secretariat of the EEA Grants and Norway Grants, and is affiliated to the European Free Trade Association (EFTA) in Brussels. We are looking for a highly motivated and qualified candidate take on the post of the Head of Administration and HR Unit in the FMO’s Compliance and Administration Department. The overall objectives of the Grants are to reduce economic and social disparities in the European Economic Area (EEA) and to strengthen bilateral relations between the Donor States (Iceland, Liechtenstein and Norway) and the 15 Beneficiary States (Bulgaria, Croatia, Czech Republic, Cyprus, Estonia, Hungary, Greece, Latvia, Lithuania, Poland, Portugal, Malta, Romania, Slovakia and Slovenia). © 2013 Störf.is - storf@storf.is - Störf.is er þróað og rekið af Vefun ehf, kt. 620114-0650.